Last updated 24 August 2016 . By Melissa Bristol. This cool and casual haunt is located in the heart of hipster central. 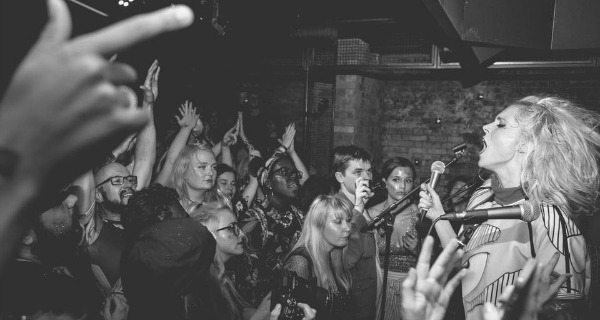 Fronting two killer venues south of the river already; these guys have brought their bespoke set-up to the residents of East London for the first time. Old Street Records promises live music sessions and a relaxed environment for casual catch ups, all topped up with a plethora of tasty drinks. Shoreditch is home to a few nifty nooks, and with an endless array of choices it can be hard to choose where you’ll settle down for the night. However the red neon sign, the black exterior, and the eccentric beats that blast from the speakers onto the streets cleverly lure you into this chilled out spot. Spread over two floors, Old Street Records features a vibrant décor with wooden hues and bare brick walls for an authentic feel. Spacious and lively, this spot is the go-to place for many on a Friday night. Grab a table whilst you can and take advantage of the table service; as it can become a bit of a problem navigating your way to the bar with a full house. 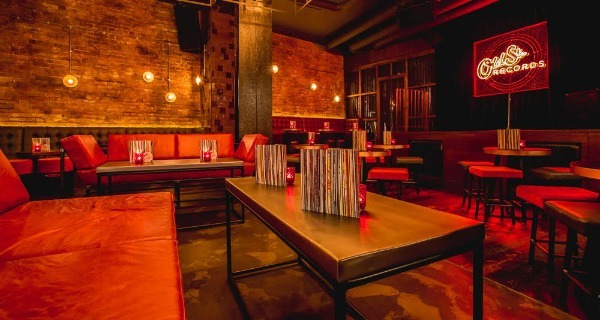 This joint will definitely delight the music lover; with a constant stream of bangers on cue, you’ll be bobbing your head along to the beat whilst you stuff your face with sumptuous pizzas and tantalising cocktails. Old Street Records have perfected a cool and casual set-up in the heart of buzzy Shoreditch. We visited on a Friday, so pizzas and exceptional cocktails were music to our ears as the weekend was getting started. Even though our tummies were rumbling, as sensible young ladies, we decided to get our rounds in whilst the happy hour (5pm–8pm) was still going strong. Our tastebuds were yearning for something with a sweet tang; so the night began with a Mango & Passionfruit Daiquiri (£8.90) and a Smoked Pineapple Punch (£8.90), both of which hit the spot with the fruit laden concoctions. As the cocktails were packed with plenty of punch, we thought it time to order some food to soak up the alcohol and tame the cravings. On the menu were some mouth-watering choices, from the classic Margherita (£7) to Quattro Stagioni (£9), a mouth-watering mozzarella, mushrooms and artichoke topped pizza. We opted for the Diavola Nduja (£9), a modern twist on the good ol’ classic pepperoni, using fiery salami and spicy sausage. Even though we had to wait quite a while for our pizza to arrive, it was definitely worth the wait. I know it’s only a pizza - but it was delicious, filling and brought plenty of joy to our stomachs; a real rustic treat to complement our boozy cocktails. To top it off, we were treated to an extra helping for our long wait, proving that these guys do care about delivering good service. Bellies full and first round down, more drinks were on the way. This time round was the Jim’s Paloma (£8.90), a tequila based cocktail that was a refreshing delight to my tastebuds. My friend stuck with the fruit laden cocktails and opted for the gin based Raspberry Collins (£8.90), which was very sweet, yet equally as good. 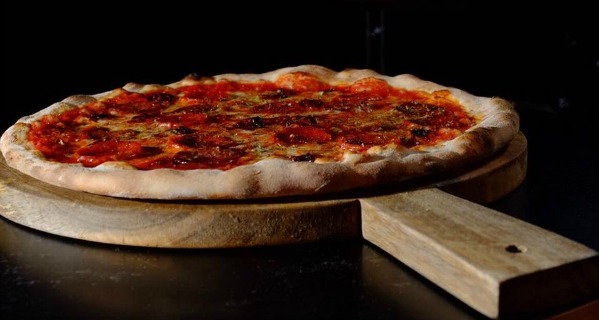 Indulgent pizzas, a stream of cocktails and good service; what more could you want? As mentioned previously, I headed down on a Friday night after work – so it was pretty rammed, and finding a seat can be a bit of a chore if you haven’t made reservations. The atmosphere is very laid back; with a choice of high tables and comfy sofas amid a light and buzzing atmosphere. With the name Old Street Records and stacks of vinyls behind the bar, great music was expected – and they did not disappoint. A vast array of tunes were on rotation to cater for all ears, although it was a bit on the loud side (I wouldn’t suggest coming here for a heart-to-heart). I would recommend coming on an event night, where you can descend the stairs to the secret den where live music sessions and intimate jazz nights are aplenty. These guys are serious about their music, with frequent live shows just like this. Old Street Records brings a fresh and vibrant ambience to Shoreditch; with a flow of cocktails, rustic pizzas and great music to offer the perfect wind-down after a stressful day. I would definitely recommend this haunt for a catch up with friends, and their live music nights make it a great venue for date night. A true Londoner; despite what the name says. Lover of cocktails, all things foodie and a good Netflix binge.